Leader: From God comes our salvation. People: For God alone our souls wait in silence. Leader: God alone is our rock and our salvation. People: God is my fortress; we shall never be shaken. Leader: Friends, speak the good news of our salvation. People: God freely bestows grace on us through Jesus Christ. Leader: In Christ we receive redemption and forgiveness. People: We are reconciled to God and one another. ALL: GLORY BE TO GOD. ALLELUIA! AMEN. Where’s the sidewalk? 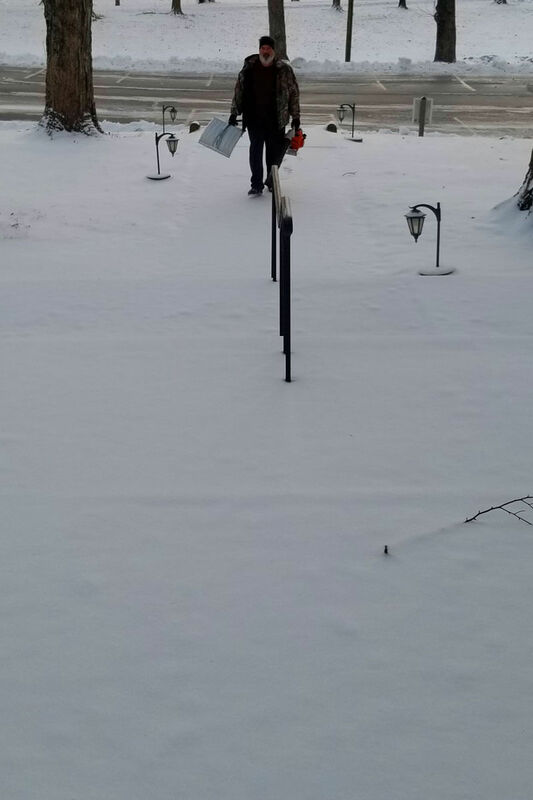 Property Team Member Jay Poole arrives with a shovel to clear the walkways before the service. With the whole church … We affirm that we are made in God’s image, befriended by Christ, and empowered by the Spirit. With people everywhere … We affirm God’s goodness at the heart of humanity, planted more deeply than all that is wrong. With all creation … We affirm and celebrate the miracle and wonder of life and the unfolding purposes of God, forever at work in ourselves and the world. Amen. We thank you, God of love, for the promise that is ours to keep because of Jesus of Nazareth. We are grateful for the generosity aroused in us by Christ’s coming into the world. May these gifts represent a new spirit of joyous sharing among us, for the sake of all your children everywhere. Amen.